Approx. Size :length adjustable.Yak bone nugget : 5/8"x 5/8"x 1/8"
Thisisan exquisite Yak bone Bracelet with Eight Auspicious Symbols Engraved on eachbutton. 1. White Conch:proclaims the teachings of the enlightened ones,humanize allfresh. Tibetan people think it not only exorcise but also make all your wishcome true. 2. Lucky Vase - containing the holy water or precious stone to symbolizethepower of buddha is the nectar of immortality. Tibetan people think itbringslucky, intimity,and wealth to them. 3.Baldachin - protects from all evil and protect the truth. Symbolizes thepowerof buddha's edification.Not only Tibetan people think it protect themselvesfromoutside harm but also bless the smoothness of their career . 4. Lucky Knot of Eternity - original meanning is love and self-devotion.NowTibetan people think it could bless the good fortune smiled on them. 5. Clever Lotus - fragrance,clear,tenderness,pleased. The holy Lotus releasessoulfrom all the annoyance and brings wisdom. 6. Goldfish - Tibetan people believes goldfish can d raw a good wealth tothem. In Buddhism, it represents the wealth of spirit and substance. 7. Victory Standard - An oriflamme of ancient India,In Buddhism,proclaimsthevictory of cultivation. 8. Dharma Wheel - symbol of spiritual law. 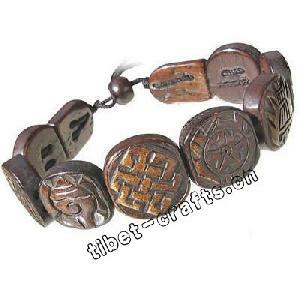 Tibetan people bless to have achangeof luck by wearing this symbol. All my artswork are completely hand made in traditionallow-tech workshops byNepalese artisans with passion and creativity. The finish has the unique style and charm, not liketheone made from the factory. Each pieces are so unique. NO two pieces are exactly the same. So if youlikeit,Don't miss it! Have it and appreciated their enriched culture! It can bring great fortune to you too!